Well, don’t I feel dumb. A while back I ordered an “unofficial” recoding of Don Carlos from one of the usual places, because Sondra Radvanovsky was singing Elisabetta and I wanted to hear it. When I got it, I was disappointed when the first disc began with the San Yuste scene (“Carlo il somno imperatore”). I thought Act I was missing, because although I knew there were various longer and shorter versions of this opera with different sections added, removed or revised, I had never yet heard one that began at that point of the story. So, I wrote a polite email and they sent me another copy of the recording. This one was identical to the first. So I wrote another polite email and they offered to send me something else instead. I figured their recording was just missing a piece and that was that, so I accepted a bootleg of Norma also involving Sondra Radanovsky in its place. Because of the sort of operation this is, I didn’t have to return either iteration of Don Carlos. 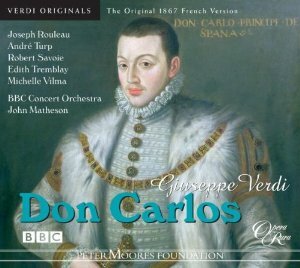 Then, this morning, I had one of those “hm, I wonder” moments and I discovered that there is in fact a version of Don Carlos that omits Act I and begins with the San Yuste scene, and it was this truncated version that the San Diego opera elected to perform back in 2003. It’s a rarity in some sense, I guess, because I have never before either on CD or in an opera house encountered the opera in this particular form. After all, as these things go, Act I is a pretty good act. I rather like the Carlos/ Elisabetta duet – in fact, I was particularly looking forward to hearing Radvanovsky letting fly Elisabetta’s excited high notes toward the end. So, I suppose we can say that I have learned something. We could also say, however, that I have probably convinced the customer service email person at PremiereOpera that I’m either an idiot or wicked sneaky – but fortunately, that is all in the past now and I can go and listen to my new recording of Norma. Ita sul colle, Druidi, etc. etc. I have never heard a rendition of this where Elisabeth’s big high notes in “de quels transports poignants” (text, in either French or Italian: “Ah! !”) are so bright and gleamy and seem to come as effortlessly as they do here for Mattila. It’s really kind of perfect, like Elisabeth’s poor happy little teenaged soul is just shining in the air there for a second or two. Also, Waltraud Meier (Eboli) cheats a bit on some of the ornaments in “au palais des fées” but that slower middle section of “o don fatal” was pretty magic. See also Posa’s death scene. Some day I will have listened to every extant recording of this opera, and if each of them has one or two moments like this that make them distinct, then the time will not have been misspent. Either that or I will have been institutionalized. One or the other. Another thing I learned today: apparently in Finnish there is a word specifically for a car accident involving elk. This has nothing to do with Verdi, but I wanted to get it out there. Did you know that one of Philip II’s secretaries was a man named Antonio Perez, and that Perez and the Princess of Eboli were political allies in the 1570s? But anyway, I couldn’t find out why exactly this otherwise not particularly Spanish northern family contained not one but two men named Don Carlos – unfortunately, we do not own any of the more detailed family papers that might explain it. 1. James McPherson, Battle Cry of Freedom: The Civil War Era (Oxford: Oxford University Press, 1988), 392-417. Michelle Vilma (Eboli) also occasionally sounds a little harsh, for example in parts of the trio with Carlos and Posa and in bits of “au palais des fées.” Also I kept losing her in the Act IV Philip/Elizabeth/Eboli/Posa quartet, but that might have been a microphone placement issue rather than Vilma herself. There were a few things orchestra-wise that seemed odd to me, but in a neutral way, like the accompanigment accompaniment (damn French getting all up in my spelling) to Phillip’s “elle ne m’aime pas” which if my ears do not deceive me involves not a solo cello but rather a whole section of cellos. Weird. But on a brighter note, the clarinettist in the first part of Carlos and Elizabeth’s “O bien perdu” duet did a very pretty job. The clarinet is prominent through the first part of the duet, where Carlos is singing; when Elizabeth comes in with “O dieu clément” the pattern the clarinet had is taken up by the violins. The clarinet bit involves both duetting with the tenor and several series of repeated notes at transitions, all of which this clarinettist, whoever he or she was, did very elegantly and expressively. This Opera Rara recording of Verdi’s Don Carlos is a mixed bag. I got it because I wanted an audio-only recording of the complete 1867 French version. As far as those two things are concerned, this recording’s credentials are impeccable. It is undeniably complete, clocking in at close to four hours. It is also unarguably in French. According to the booklet the principals are all Francophone, which is great, although the more subtle benefits of this are probably lost on me. But aside from its length and Francophility Francophonitude Ph being in French, I am not sure that this performance is one to seek out on its own. And then there’s Jonas Kaufmann as Carlos, who is certainly also a reason to listen to this. His voice sounds deeper and more solid than some other Carloses I have heard; this Carlos is youthful and passionate, but he doesn’t give the character that “confused and in way over his head” vibe. In terms of concept this production did not seem radically different from other productions of this opera that I have seen. But the acting and stage direction do do something rather sweet and human and emphasize that Carlos and Elisabeth love each other in that elevated Verdian way, but they also want one another and crave the comfort of human contact. The two are about to snuggle up together on Carlos’s cloak when the chorus shows up in Act I to give them the news of the great change in plans; there are moments all through the opera where Elisabeth has her hands on Carlos’s shoulders or arms and then suddenly pulls back with this sort of “Merde! I’m touching him again!” look on her face; they consistently have their hands on one another during their big moments together, but it’s neither unalloyed lust nor a simple need for human connection – it’s somewhere between the two, and the fact that they can’t (for a variety of reasons) make it one or the other is fairly key to their whole unhappy situation. This Don Carlos was broadcast from Salzburg back in August. Apparently it has been on and off YouTube ever since – I think the Salzburg people are probably fighting an uphill battle as far as that is concerned. But isn’t that Firefox widget that adds a ‘download’ option to YouTube videos really cool? I say this only as an unconnected observation, not because I have been downloading videos of Salzburg broadcasts. The production that the Met used for this show was the one discussed here. Certain aspects of it look much better live than on DVD – the large dark space that houses Charles V’s tomb, for example, is far more deep and cavernous looking on the stage than on the screen. The effect of the heavy walls with the rows of tiny square apertures (windows seems the wrong word, since no one ever looks through them) is also stronger. I like the way this looks. It’s not my favorite production of this opera, but I like it. The standout for me in this performance was Marina Poplavskaya as Elizabeth. She’s really wonderful here. One other thing about the production. Unlike in many versions, where Carlos is hustled off into the tomb or otherwise ambiguously disposed of, here he really does die at the end, which I appreciated. It’s a little more satisfying than that typical nineteenth century ‘death but not really kinda sorta’ thing, like with Carlos being pulled into the tomb, or to take another example, the end of Wagner’s Der Fliegende Holländer where Senta is supposed to leap into the ocean and drown but also be spiritually reunited with the Dutchman. I’d much rather we cut to the chase and have dead people be dead. And here Carlos is definitely dead – after a sword fight he’s wounded, falls, and expires in Elizabeth’s arms. If he can’t die in that particular location metaphorically, he at least gets to do so literally, I guess. For the record, this performance of Don Carlos is the Italian version and does not have either the first Fontainebleau scene, where the poor French peasants complain that life is hard, the scene later on in which Eboli and Elizabeth switch masks so that Elizabeth can avoid a palace party, or the ballet. It’s still five acts, but it doesn’t have all the same pieces as the five-act French version. Having thought about it, I think I’m rather partial to the five-act 1867 version in French. But I like the Italian one too. I guess I had this coming, but I woke up this morning with the chorus from the ‘auto-da-fe’ scene from Don Carlos in my head. One of the moments in this play that I found really interesting occurs in the first scene of Act IV. Eboli has just had what by all indications was a not terrifically fun night with the king, Carlos is (as usual) in trouble and Posa comes to Elizabeth to ask for her help. And Elizabeth cheerfully commits what I can only categorize as treason. And no one appears to notice. So. What ‘acting’ means in an operatic context has clearly changed over the past thirty-two years. We expect more subtlety and perhaps a little less stiff grandeur than audiences a few decades ago. As a result the emotional tone of this production seems strange, even stilted: Carlos, for example, is pitched so much as the ‘manly romantic hero’ that he comes off as a bit of a stuffed shirt. Our Carlos here is Vasile Moldoveanu. And he sounds very nice. But Carlos is a little too much in control of himself. He is sometimes tormented, of course, because he’s Don Carlos. But neither his sudden and ill-advised infatuation with Elisabeth nor his sudden and ill-advised political awakening nor any of the rest of it ever ring true in terms of characterization. Moldoveanu just looks concerned and/or slightly rattled most of the time. And where you might expect Carlos to be warm or enthusiastic, it doesn’t quite happen – Posa doesn’t even rate a hug when he shows up. They sort of touch arms and back off. It looks like a version of ‘manly’ emotional control, but Carlos is not really a person who has a great deal of that, if you think about it. If you are looking for the opposite of Regietheater, as I was doing this weekend, a Met production from the early 1980s is a pretty safe bet. You go into it expecting a certain style of soothing literal-mindedness, and that’s pretty much what you get in this case. So. This DVD of Don Carlos is well worth anyone’s time. I ended up liking it for what I think are the right reasons and disliking for what I am sure are the wrong ones.